The countries in Central America have played a significant role in the rise of the U.S. empire since the mid 19th century. Multinational corporations have long enjoyed rich returns on their speculative ventures in the Central American economies. The average American consumes cheap fruit, coffee, and other products grown or extracted from Central American soil. The U.S. military has deployed troops, provided weapons, and trained officers in this region more frequently than any other region in the world. Despite this history, U.S. relations with El Salvador, Guatemala, Honduras, and Nicaragua rarely make headlines in the U.S. news. The exception was the tumultuous 1970s and ‘80s, when the Sandinistas overthrew the U.S.-backed dictator, Anastasio Somoza, and revolutionaries in El Salvador and Guatemala waged campaigns to overthrow their repressive governments who were also being supported by the United States. When the gun smoke finally settled with the peace accords in El Salvador in 1992 and in Guatemala in 1996, hundreds of thousands of civilians had been killed (the majority by military forces trained and funded by the United States), and hundreds of thousands more had migrated to Mexico or to the United States. This series of lessons invites students to investigate the role of the United States in Guatemala and El Salvador in the 20th century. The unit launches with a mixer activity, in which students learn about a key figure in Guatemalan history, starting with the 1944-1954 “Ten Years of Spring,” the 36 year-long civil war (1960-1996), and on through to the present. 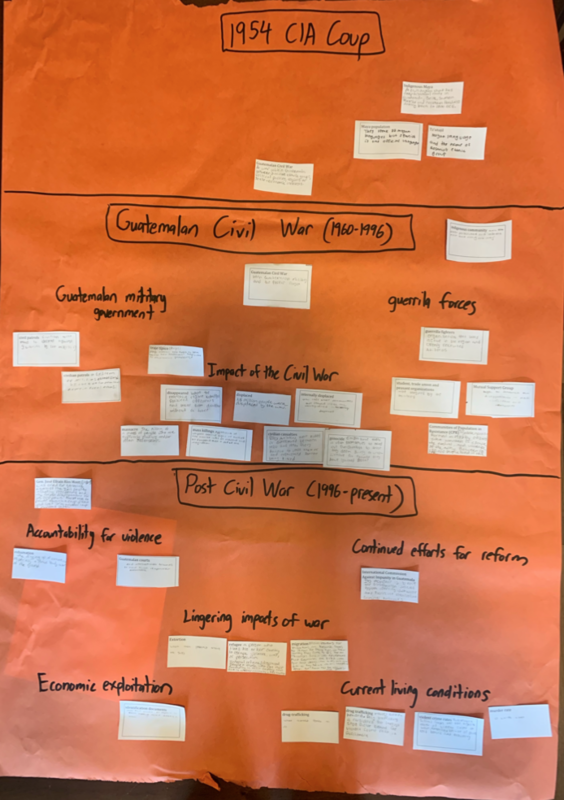 Each student takes on the role of one historical figure and they converse with each other in these roles, discovering key storylines in the conflict in these discussions. Next, the investigation focuses on El Salvador, which received more than six billion dollars in military aid from the U.S. during its civil war from 1980-1992. Through a role play, students investigate a variety of perspectives on the Salvadoran Civil War.Each student assumes the perspective of a key stakeholder from this time period and advises the newly elected president, Ronald Reagan, on what policy to pursue in El Salvador. Students then explore the short and long-term effects of U.S. policy in Guatemala and El Salvador on ordinary citizens through the stories of characters on the “When We Were Young/There Was A War” website.Students take notes on key terms, people, and ideas and then participate in a concept-mapping activity to draw conclusions about how U.S. intervention shaped the civil wars and how the after-effects of these conflicts continue through today. Finally, students demonstrate their historical knowledge and critical thinking by writing a persuasive essay evaluating the U.S. involvement in El Salvador from 1977-1996. Each of these lessons can be taught as a stand alone lesson or as part of a larger unit. Learn about the history of El Salvador and Guatemala by reading the information posted in the El Salvador Maps and Facts and the Guatemala Maps and Facts tabs on the “When We Were Young/There Was A War” website. The Center for Justice and Accountability has brief histories of conflicts in El Salvador and Guatemala posted on its website. What motivated the United States to intervene in both Guatemala and El Salvador in the latter half of the 20th century? What were the short and long-term effects of U.S. economic, political, and military intervention in Guatemala and El Salvador? When, if ever, should the U.S. military intervene in conflicts in other countries?